LIVE THE ONLY HOUSE IN CLUB REAL - RESIDENTIAL AREA- IN PLAYA DEL CARMEN CREATED SPECIALLY TO KEEP THE PRIVACY AND COMFORT OF EVERY GUEST. CASA MAX HAS A TERRACE, PRIVATE GARDEN AND POOL. CASA MAX YOU WILL FEEL THE RIVIERA MAYA ELEGANCE, ENJOY THE WEATHER, THE LOCAL GASTRONOMY AND THE ATTENTION TO EVERY DETAIL BY OUR STAFF. •BEDROOM 1 - MASTER: King size bed, En-suite bathroom with shower and Jacuzzi, Toiletries, Air conditioning, Ceiling fan, TV HD SMART, 100% cotton linens,Closet. •BEDROOM 3: Queen size bed & Twin bed, En-suite bathroom with shower, Toiletries, Air conditioning, Ceiling fan, 100% cotton linens,Closet. •Beach stuff: snorkeling sets, swimming boards, beach toys. •Maximum 4 children allowed – under 5 years old. DISCOVER PLAYA DEL CARMEN... LIVE THE CASA MAX EXPERIENCE! Great home away from home!!! We really enjoyed our vacay. The home is amazing. 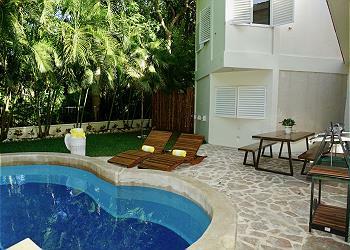 Located inside a gated area in Playacar Fase I. The home has four Bedrooms all with new TV´s, WIFI, Sky. The kitchen appliances are new, were clean and ready to use. We were a group of 11 and we really enjoyed our time. PLAYAMOMENTS and Karina gave us an excellent service and we look forward to coming back next year for our family reunion. Loved the views to the Golf course! Estuvimos muy contentos con nuestra propiedad; la casa se encuentra en una cerrada muy famosa de Playa del Carmen, excelente lugar para quien como nosotros quiere pasar unas lindas vacaciones en total relax, lejos del ruido nocturno y al mismo tiempo en unlugar lleno de áreas verdes y cerca de las mejores playas. La renta de la casa nos dió la oportunidad de tener acceso al club de playa del hotel The reef, ubicado en la misma zona "hotelera" de playacar, lo cual fue excelente opción viajando con niños. Desde la reservación hasta la salida fuimos consentidos por el excelente team que Playa Moments nos ofreció, fueron siempre muy atentos a nuestras exigencias y nos brindaron una atención personalizada en todo momento. La casa está realmente hermosa, receintemente renovada y con todo lo necesario para una estancia placentera, nuestros hijos disfrutaron de sus cuartos y de la pequeña alberca privada mientras preparabamos deliciosos bbq. Las amenidades que Playa Moments nos ofreció son de primera, toallas y sabanas suaves y siempre frescas y limpias hicieron muy agradable el descanso en la casa. Seguramente volveremos ahi muy pronto, nos sentimos como en casa! Rentamos esta casa para unos amigos que venian de visita. Quedaron todos muy felices con el espacio, el internet funcionaba super bien, disfrutamos de la alberca, la terraza, la parrilla. Teniamos todo lo que necesitamos y es una zona super tranquila y seguro. Con el auto recorrimos todos los parques, fuimos a Xplor lo super recomiendo, Xcaret y las ruinas de Tulum. Seguramente volveriamos a rentar esta hermosa casa. Gracias a todo el staff. Best Experience in my life!!! My best experience and vacations in my life!!! Very nice luxury Villa!!! Great Location!!! Definitely all my family, friends and I, will be back at our next vacations!!! Congratulations to all the nice staff!! The best friendly and helpfully staff in all my vacations in the world!!! Cheapest prices for a Luxury Villa, with all the most basic furnitures and services with the best location in Playa del Carmen!!! In the end the most wonderful vacations in my life!!! Definitely see you next time for another wonderful vacations!!! Amazing Villa living next to the Golf course! Casa Max is an amazing option if you wish to stay away from downtown but at the same time be close to the ocean and the famous 5ta Avenida. We were a group of 11 and we had a blast! The Villa was recently renovated and everything in it is new! The pool and lounges are amazing and the private yard comes with an Argentinean grill. The WIFI service is superb. We were able to log in to Netflix and Amazon using our accounts and the Smart TV`s this home offers! Plenty of options for everyone! They also have satellite TV channels call Sky. Central AC, great housekeeping service and also our Concierge by Playamoments did an outstanding job. We will come back! We love the golf and the views from our rooms. Also the gated area offers great amenities such as game area, tennis courts and much more. Thanks Karina and Playa Moments!